Been distracted with other stuff the last week or two, so to keep the buildhost busy a big batch of WBEL3 packages have been building and should be available for your Up2Date/Yum pleasure. This covers all errata through today and also includes Update 9 from upstream. These will eventually get respun into the final WBEL3 Repin4 iso set. WBEL4 Respin2 is mostly out to the mirrors now and the BT seeding will begin with the i386 DVD getting the heaviest bitrate first. Ok, no updates on the webpage for a year but then there hasn't been anything to really say. Updates have been rolling out though there were a couple of gaps in this last year longer than I would have liked. Anyway, time for an update. First off WBEL4 Repin2 is coming soon, with luck tomorrow. Would already be out if RH hadn't dumped OO.o and OO.o2 updates yesterday. No sense releasing with that much known errata in the pipeline. Yes there is a WBEL5 in progress. Considered just hanging it up and letting CentOS/etc take it from here but I got interested in learning about mock. So WBEL5 might be the first OS totally self hosted in mock. Fair warning though, unless something changes my mind WBEL5 will probably be the last one. Gotta pull the plug far enough out to cover errata and respins. And if the past is any indicator I would be using WBEL6 about as little as I have used WBEL4 internally. WBEL3 has been on our workstations and primary servers until now and as we refresh the workstations this year they will get WBEL5. That means 6 would only get the odd machine here and there like 4 has been deployed only in a few spots. Current thinking is WBEL3 will get one last respin soon to roll up the last Update from RH and then keep errata to the EOL from upstream. WBEL4 Will get respins until RH stops updates and errata though Dec 31, 2010. This sorta splits the difference between the original five year life span when RHEL first announced their EOL policy and the new extended seven year horizion. If interest is still there and a nasty bug appears I'd of course issue an update anyway. WBEL5 will get support until July 1, 2012 with the same proviso about nasty security issues as WBEL4. The WBEL signing key was created with a ten year expiration date and that seems like a good time to call a final stopping point. The key expires October 31, 2013. No errata will issue after that date and none issued earlier will install without manual intervention. These dates are somewhat arbritrary but somewhat reflect how I will be planning on retiring hardware. When the White Box project was started there was a bigger need than today. As CentOS and Fedora show more signs of formal recognition and cooperation I'm hoping it assumes the role of the "Longterm stable Fedora/RH" that we were all looking for when were faced with the loss of RHL back in 2003. If you see ISO images for WBEL4 Respin1 (should only be x86_64) on a mirror with an April 21 date do not download them. A prerelease copy accidentally escaped. They should soon be replaced with files dated April 28. General availibility for WBEL4 was planned for tonite or tomorrow but this screwup might push it back a day. So much for the plan, was building packages and noticed all of the errata for WBEL3 was done, so have went ahead and respun it first instead of 4. It is available via Bittorrent now and will start moving to the mirrors soon. Seeding the i386 CD images hard right now and will shift bandwidth to the others as soon as a few seeds appear. Ok, plan update, remote root exploit in sendmail moved to the top of the list. All four set of updates posted, if you can't wait for the mirrors grab em off the main site. Jeeze, has it really been six months since I updated this page? Updates have nevertheless been flowing spradically in this long silence. Should have 'real life' back under control now, so back to more geek fun! A large batch of WBEL4 updates are just about to roll off the build chain. Except for the trademark heavy packages like anaconda this batch will have things current through RH's U3 release. WBEL3 is current as of just before U7 dropped last week. Catching up with that will be the next order of business. Then work will move to respinning WBEL4 and then 3. 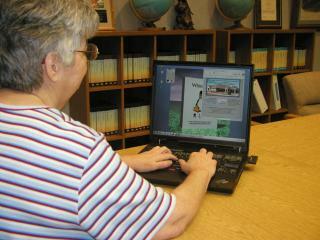 While all of this package rebuilding is going on hoping to get some tinkering done on the webpage. Hurricane Rita approaches and long power and other utility failures are in our future. Expect service outages. Our primary internet server suffered a major failure this past week. Most of our operations are up and running again with the exception of the web interface to MailMan, hope to get that back this weekend. A bunch of errata for WBEL3 is hatched, covering all of U5 and all but three outstanding erratas, those are in the pipeline. But there is a catch; db4-java is gone for now. RH is switching from IBM's JDK to GCJ and I have so far failed to get db4-java to build. So instead of continuing to hold up all of these updates I have switched off the java support in the db4 srpm. The practical upshot of this is that you must make a decision before you run up2date. If you aren't using db4-java make sure the package isn't installed. If you are using it, add an exception to up2date/yum to leave db4-* alone for now, otherwise it will just throw an error and bail out. Hopefully this will get sorted out soon and db4-java can rejoin. Nothing serious, just switching Internet providers here at the library. And in case you have been wondering, that is a big reason for the lack of updates the last couple of weeks. Ok, long time no updates. Some errata needs listing, coming soon. In the meantime, since there was a request here are the artwork files. Perhaps someone more artistic will take off and run with em. 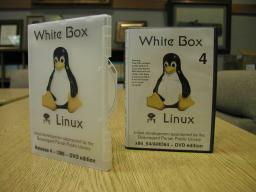 White Box Enterprise Linux 4 is moving to the mirrors now. 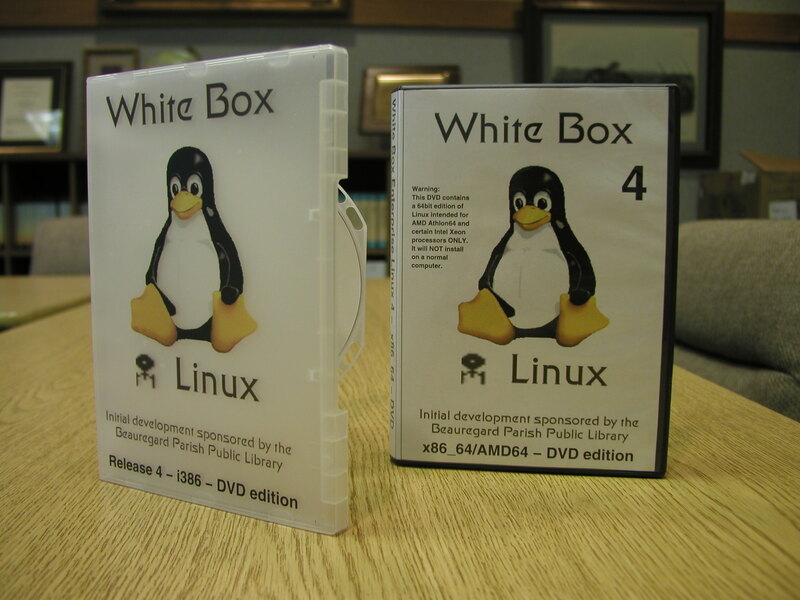 While waiting for that I whipped up a couple of white boxes to put into the library's collection. Can't find the stash of 7CD boxes so waiting to burn CDs. Mainly playing with artwork. Any interest in posting the art? In what format? They were created with xfig. Yes, this means I'm back and wading through the mailspool. Looks like the site survived the Slashdot Effect last Monday. Not bad for a such a poorly connected site. Welcome Slashdot viewers. After the smoke settles, check the mailing list archives, etc. Just don't expect replies to mail until next week because I'm on my honeymoon right now. A preview of WBEL4 is currently available via BitTorrent. It is believed to be feature complete except for the inclusion of the yum config info to allow updating. Since there isn't yet a download tree for 4 on the mirrors this isn't really an issue for testing yet. This release is i386 only because the x86_64 building has only just begun. As an RC, I didn't bother to GPG sign anything. The artwork is trademark clean but lame in several places. This is being worked on. This release goes much farther in removing Red Hat's brandname from the software than 3.0 did. This is probably where most testing should concentrate. I don't think I have done anything that would prevent 3rd party packages from installing but check what YOU care about. None of the Errata has been integrated into this build. This will happen for the final release. Due to problems reported from other rebuilds, thunderbird and dhcpd really need to be hammered on. Tora was not built with Oracle installed so there is no tora-oracle package. This will be fixed for the actual release. Several mirrors have now updated and the torrents are also flowing fairly well. Also updated the howto page with the latest version of my build scripts. 3.0 Respin 2 is currently moving to the mirrors. Our limited bandwidth will remain dedicated to that until the rsyncs finish then the BT seeds will open. New for this release are DVD iso images which will currently only be available via BT starting later today. A major realignment of the mirrors is mostly complete. The website is being updated to reflect the new reality. Work on incorporating the recent release of RHEL3 Update 4 into a new respin of WBEL is underway. Most of the new packages are already available via Up2Date or Yum. Regarding RHEL4. I have a copy of Beta2, which RH has announced is the final public beta and will get to work on rebuilding it as soon as Respin 2 of WBEL3 is on the server. Doing so should make make respinning the final release fairly straightforward. If you are running a webserver, update php NOW as there are reports of an exploit in the wild. If up2date and/or the mirrors doesn't have it yet, try these direct links. The x86_64 images have a fatal flaw and won't boot. A replacement boot image is available on the download page so you do not have to download the entire set over. A replacement set of ISOs will come as soon as I understand what went wrong in the first place and TEST, TEST, TEST. Respin 1 is now available for download via both Bittorrent and ftp. Some of the mirrors haven't synced all of the images yet but you should be able to grab a set. Still basically in a holding pattern until U2 drops, but in the background some other interesting things are happening. Development is moving to a new Athlon-64 based machine and an official AMD64 port with errata releases at the same time as ia32 is in the works. So when you start seeing packages built on bob.whiteboxlinux.org, the pic on the right is where they were hatched... although I might not actually be there of course. Isn't UNIX a beautiful thing? In other news, since it is now pretty clear an official ia64 port isn't in the cards from me, a whitebox-ia64 mailing list has been launched for those who need one to hammer out how it is going to happen. Guess you can think of it as OpenSource in action. Added a FAQ page. It only has a couple of items to start with but one has to start somewhere. Caught a Brown Paper Bag level screwup and have issued new ISO images. WBEL 3.0 final is now available for your downloading pleasure. This time the announcement was held back until the mirrors had a chance to catch it so downloading should be easy. Movement is happening on AMD64 and ia64 ports. Watch this space for details or join the -devel mailing list and get involved. The final 3.0 release is probably going to drop Tuesday or Wednesday. Just a heads up. Added a new mirror at Joint Astronomy Centre. Release Candidate 2 is now available for download. FTP will not catch up for a bit so BT is the way to go right now. Ok, no news updates on the webpage for a bit so here are some interesting numbers. From initial release on Nov 13 to the end of the month there were 885 successful ISO transfers via BitTorrent. And considering that after the first ftp mirror went live BT traffic took a nosedive that isn't too bad. Web traffic for the month of November was also higher than I would have ever guessed. By my grepping, and taking into account both domain names content is visible through, I count 18,438 loads of the homepage. Of course the big question is "When does RC2 drop?" Answer: unless something goes wrong, within 24 hours. We had a harddrive fail last week so when the replacement showed up my boss decided to use it as an opportunity to try out White Box on her laptop. So I installed it, dropped in the binary rpms intended for RHEL3 and the WinModem runs! It is also running a copy of Applixware by use of the RH 4.2 compatibility libraries from RH5.2, XV from Power Tools 6.2 and AbiWord from RH9. Brown Paper bag time. The RPM-GPG-KEY file on binary CD1 and the signing key posted on this website up until today are wrong. If you imported a key and rpm -qa gpg-pubkey* returns gpg-pubkey-adc599ed-3fa300b9 you should remove it and download the correct one. It should show as gpg-pubkey-73307de6-3fa300b9. In other news, installed White Box on the build machine from CD without incident and have commenced rebuilding on itself. Should have results on Sunday. As of about 1AM CST around 250 ISO images had been delivered via BitTorrent. My back of the envelope calculations make that about a 5-1 multiplier over what could have been done with ftp over our pipe. Release Candidate 1 is posted for download! Ho boy! Build it and they will come. I told five people last nite and by today the news is all over the net. Many emails have asked for details on how I built this thing so there is a new link on the left. 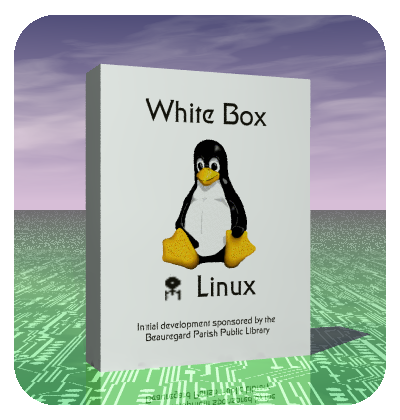 And yes, today I laid claim to whiteboxlinux.org and will be bringing it up soon. Getting offers to mirror and am following each of them up. But the Bittorrent is pumping out a fair number of bits already. Mirrors might allow ftp access to those who haven't joined the BitTorrent generation. Red Hat DID NOT build RHEL3 from the published srpms. Period, end of story. They didn't even build taroon from it's source. Openssl's srpm does not build the same binaries as the ones supplied in taroon and it is the same srpm as the one in RHEL3. I'm porting in a copy from fedora which builds correctly. Plus the package set is not self sufficient to actually build itself, several additional srpms need to be tracked down. Intentional GPL violation or carelessness? I'm reporting, You decide. The real wierd part is that a diff between RHEL and Fedora's openssl package reveal no differences that could account for the linkage errors. But RHEL's openssl package doesn't produce a /lib/libssl.so.4 linked with with the kerberos libraries and Ferdora's does, building on the same Taroon+ machine. This problem has disappeared when rebuilding on White Box itself. And to clarify, RHEL used the supplied srpms, but they don't appear to have used them at the same time and on a build environment very close to RHEL itself. Which is why they have so many missing build dependencies, their build host had them installed so they never knew about the dependencies. This is one problem White Box hopes to solve, by providing a distribution known to be able to build itself ON itself. Finally think I have this one tracked down. After more back to back building it looks more like a RANDOM thing, probably SMP related. It will slow down builds, but booting UP mode is probably the safest bet. The Kernel is a horror. The miracle is that it builds at all. It won't build for i386, i486 or i586. Of four platforms I have tried taroon or WhiteBox on, three have issues. RedHat doesn't claim support for the EPIA's but they DO claim support for P-II machines with Intel chipsets and Dual Xeon's on Intel motherboards. 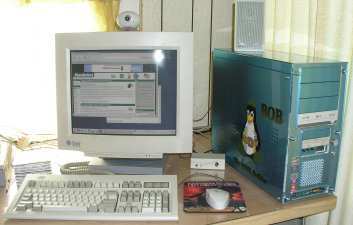 The P-II loses the network (3COM PCI) after performing a network install and the Xeon hangs on shutdown while flushing the Intel RAID controller. Only our generic Celeron machines run correct. I'm planning to pull in either Fedora or RH9's kernel as an option, probably through the expedient of spinning two disc 1's. The rpm for at won't build correctly, so RedHat dropped in a switch to skip the regression testing instead of fixing it. Is this Enterprise ready? Does Sun ship products they KNOW fail regression testing and we just never find out because they don't ship source? Yes, I also used the switch because I'm not the sort of ubercoder that would be needed to track down the obscure failures that I saw. This one also disapears in recent builds. Others have also reported this problem and it looks more like a glibc problem that is fixed in the most recent version.